With one out to get for the 2014 World Series title, a colossally bad defensive play threatened to lose the Giants a championship. San Francisco center fielder Gregor Blanco missed a fly ball. Left fielder Juan Perez kicked it. Kansas City’s Alex Gordon reached third base and the Royals sent Salvador Perez to bat with a chance to win the game. Then a few pitches later, unflappable Giants ace Madison Bumgarner calmly shook off the error and jammed Perez with an inside fastball. The catcher hit a harmless pop fly to San Francisco’s Pablo Sandoval, who caught it and fell to the ground in ecstasy. The orange and black had won the World Series, again. The Old Giants couldn’t win games like this; the New Giants can’t lose them. On baseball’s greatest stage, the New eclipsed the Old in the last moments of Game Seven. Those who followed the team prior to its recent glory years know that the Old Giants mastered soul-crushing defeats, like World Series losses in 1962, 1989 and 2002. But beyond postseason failure, San Francisco also went decades between Fall Classic appearances and long stretches between playoff berths, losing a franchise-worst 100 games in 1985. They played in frigid Candlestick Park, the worst yard in baseball. Yet to the amazement of their longtime fans and the baseball establishment, the New Giants have morphed into October supermen, winning their last ten postseason series and three world championships in the last five years. Their decisive win in the World Series finale was their 100th of 2014. They play in a spectacular ballpark at 24 Willie Mays Plaza, the best in baseball. The Old Giants could do little right; the New Giants can apparently do little wrong. For those of us who grew up watching San Francisco lose in the Candlestick cold, feeling lucky if we won cheap Croix De Candlestick buttons, the surreal contrast is positively mind-boggling. In the last five years, the New Giants provided more spectacular October memories than the Old Giants produced in five decades. Among them in 2014 are Brandon Crawford’s grand slam in the wild card game against Pittsburgh, Brandon Belt’s homer and Yusmiero Petit’s shutout relief to win an 18-inning epic against Washington, and clutch home runs by Michael Morse and Travis Ishikawa to clinch the pennant against St. Louis in the most thrilling game I’ve ever seen in person. The World Series saw both Sandoval and Hunter Pence hit more than .400. Rookie second baseman Joe Panik started one of the greatest double plays anyone can remember. Catcher Buster Posey drove in critical runs and guided the pitching staff through every inning of every postseason game. Above all, Bumgarner throttled hitters from the Pirates, Nationals, Cardinals and Royals in historic fashion. All this combined with the New Giants’ October success of 2010 and 2012 provides more than enough spiritual relief to finally exorcise the Old Giants demons from their older fans’ battered psyches. Missing the playoffs despite 103 wins in 1993? Jose Cruz Junior’s dropped fly ball in the 2003 Division Series? Armando Benitez’s 14 blown saves? We can let these excruciating memories go now. Therapists may lose business, but cardiologists figure to cash in because while the New Giants win, they often do so in dramatic, heart attack-inducing fashion. Stormy weather threatened San Francisco’s championship celebration on Oct. 31. If the Old Giants had ever won a World Series, rain would surely have ruined the parade. But the New Giants drew a million adoring fans to the city and delighted in their third party down Market Street beneath just a light sprinkling. Far more confetti than rain fell from the sky. As I walked along the procession taking pictures, the immeasurable joy of the crowd swept over me. People joke that the New Giants “torture” them with tight, hard-fought games but many fans seem blissfully ignorant of the real torture the Old Giants used to dispense on a regular basis. Perhaps when the team struggles again in the future, these newer fans will come to know how lucky they have been to experience such success. 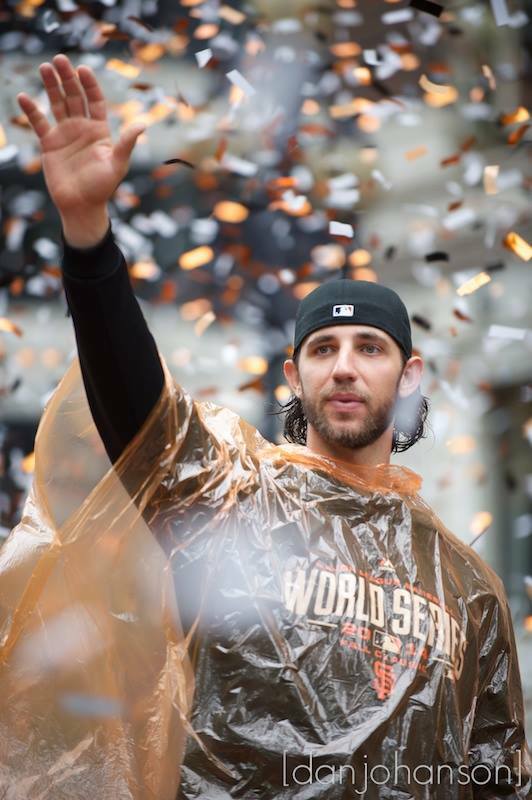 But those of us who watched the Giants rise from worst to first can more fully savor this golden age now.